Combine the yeast, honey, milk, and butter. Stir and leave for 15 minutes to dissolve. Mix together the flour and the salt in a large bowl. Make a little well in the center, then add the yeast mixture and the beaten egg. With a wooden spoon, stir the flour into the wet mixture until it is a rough dough. Transfer to a floured surface and knead until smooth and elastic. Cover and leave to rise in a warm place about 1 1/2 hours (it should have doubled by then). 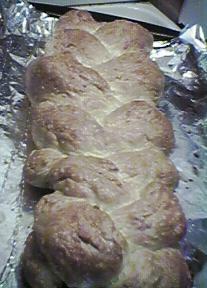 Grease a baking sheet, and after punching down the dough, make three ropes of it and lay them on the sheet. Braid the dough. (Hint: Beginning the braid at the center and working out to both sides makes it much easier.) Tuck the ends under. Cover loosely and set again to rise in a warm spot, this time for 30 minutes. Finally, preheat the oven to 375ºF and brush the loaf with its egg yolk/milk glaze before putting it in the oven. Bake until golden, about 40-45 minutes. Cool on a rack.